A new variation on the moving average system is to calculate moving averages on the Highs, Lows or Opens, rather than on the Close. Daily Highs, Lows or Opens are normally used, but the same concept may work just as well on hourly, weekly or even monthly bars. Opens are used less frequently and the discussion below focuses on Highs & Lows. 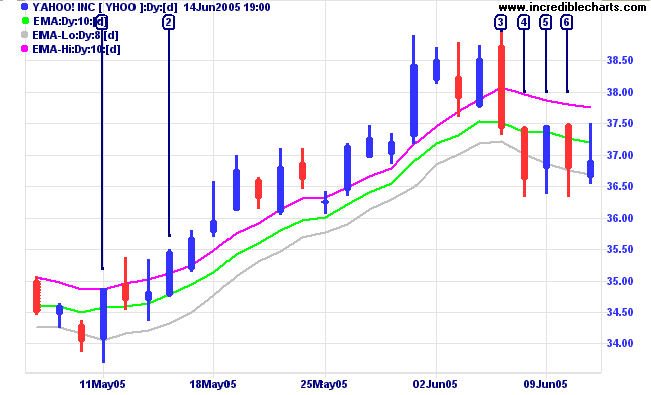 A 13-week moving average of closing prices (not shown) has been used to identify the up-trend on Yahoo (above). The stock is then plotted with a 10-day moving average of daily Highs and an 8-day moving average of daily Lows. Enter at  when price closes above the moving average (High). Exit at  when price closes below the moving average (Low). 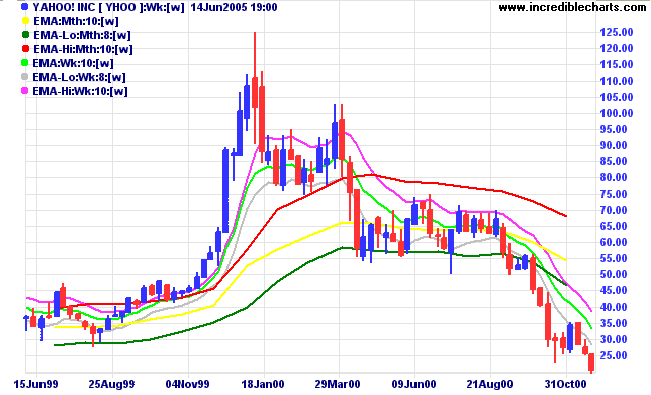 Earlier entry at  when price closes above the moving average. Earlier exit at  when price closes below the moving average. Then we are whipsawed, with an entry at  and exit at . Other filters, besides closing price, may be used to further refine the system. Late exits, especially when the trend spikes up/down into a blow-off. 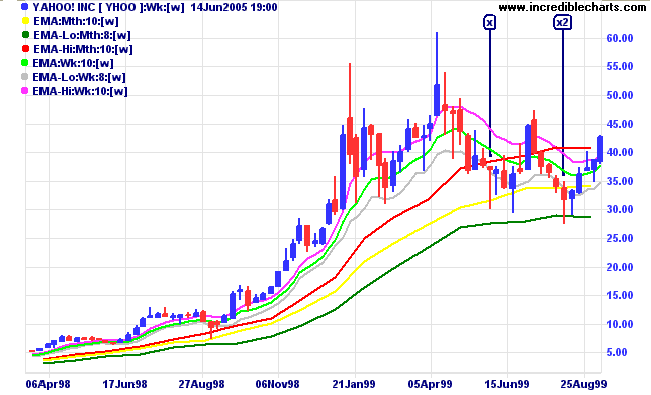 In the above chart Yahoo staged a blow-off, in late 1998/early 1999, when it accelerated into a steep up-trend. Our long-term moving averages, so good at keeping us in the trend, now let us down badly, giving exit signals between $31.50 [x], based on a normal closing price moving average, and $28.90 [x2], based on the 8-month moving average of monthly lows. Long-term MAs cannot be relied upon for exit signals during a blow-off. If long-term, to enter at the start of the trend; ride out the corrections; and exit when the trend expires. If, when trading short-term, we wait for price to cross the moving average after a correction, in any but the strongest trends, we will lose about half of the entire up-swing. If we use moving average (High) for our buy signals and moving average (Low) for sell signals, the problem is even worse. On the first pull-back (or consolidation pattern) after price breaks above the moving average (High), enter  when price closes above the previous high and then takes out the high. Exit when price closes below moving average (Low) and then takes out the low at . Compare your profit of $2.20 (before brokerage and slippage) to the swing range of $14.27 (39.79 - 25.52). Enter [A] when price closes above moving average (High) and then takes out that day's high. 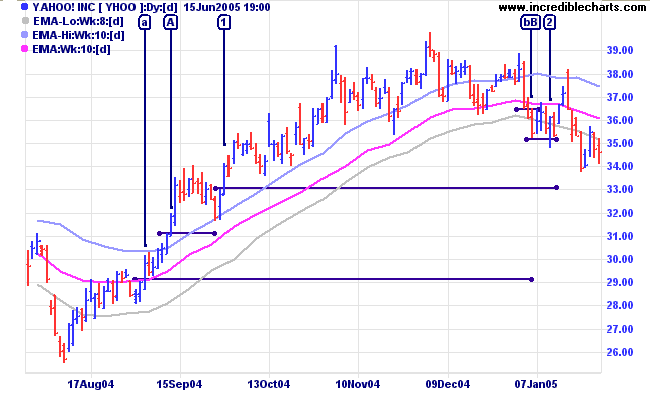 Exit [B] when price falls (but not necessarily closes) below the moving average (Low). Your profit increases to $5.30 before brokerage and slippage. On the first pull-back after price closes above the moving average, if price closes above the previous high, enter [a] when it takes out that day's high. Exit [b] when price closes below the moving average and then takes out that low. 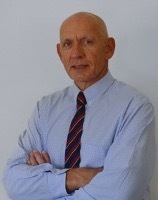 Profit increases to $7.42 (36.46 - 29.04). This is a single example and there may be times that system 3 makes a false start or exits too early in the trend, but, from what I have seen, the conventional method at least holds its own against systems based on Highs and Lows. Look for Moving Averages (High) and Moving Averages (Low) in the left column of the Indicator Panel. Edit Indicator Settings explains how to alter the default settings. Exponential or simple moving averages are calculated using either the High or Low instead of closing price. The Low is often calculated with a shorter moving average than the High: to deliver quicker exit signals. If trading short, reverse the time periods; so that the High is shorter than the Low.